The HBP's governance structure is designed to allow the Core Project (CP) to run efficiently and transparently. The CP governance will in principle remain the same for the duration of the Project. The Stakeholder Board (SB) is the Ultimate Decision-Making Body. The Steering Committee of the Stakeholder Board (SCSB) is a core group of representatives from member countries that make major financial contributions to the project. The Directorate (DIR) is the governing body responsible for the management of the Core Project and the Flagship as a whole. It manages the Project and its finances, ensures that it fulfils its contractual obligations, and puts proposals decided on by the Science and Infrastructure Board to the Stakeholder Board for its decision. The Science and Infrastructure Board (SIB) is central to the HBP, providing scientific leadership of the Core Project. It is responsible for managing the implementation of the scientific and infrastructure Work Plan, and for proposing work plans and roadmaps for each SGA. All scientific decisions are made by this board. During SGA1, a dedicated HBP Legal Entity (LE) will be created to take on the role of Coordinator for the HBP Core Project, and make possible the continuity of the HBP as a major state-owned European scientific Research Infrastructure once the Project ends in 2023. The LE will coordinate the interaction between the European Commission and nationally-funded components of the Flagship to build the Research Infrastructure. The Legal Entity will exist for some time before it is fully operational and able to become the Coordinator. Therefore, the transition to the Legal Entity is expected to take place around Months 12-18 of SGA1. The Project Coordination Office (PCO), headed by the Executive Director, manages and coordinates the Core Project, and acts as the intermediary between the HBP Legal Entity and the European Commission. The majority of the activities in SP11, including leadership, are handled by the PCO. The Flagship Governance Forum is a discussion forum that involves representatives from the two FET Flagships (HBP and the Graphene Flagship), the European Commission, and EU Member States. It aims to achieve the efficient synchronisation of the main stakeholders involved in the Flagships, and supports the Flagships' further development. 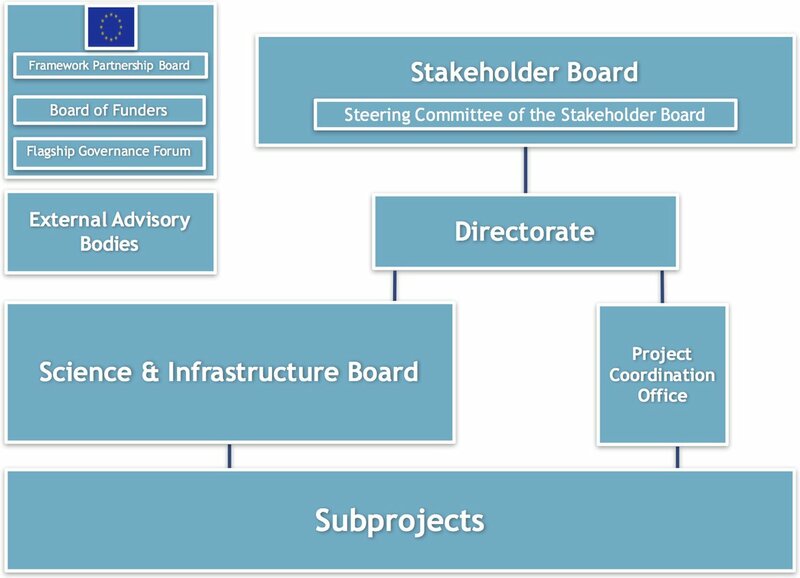 The Framework Partnership Board facilitates contact between the HBP and the European Commission, maintaining a regular and transparent exchange of information concerning strategic and operational topics related to the Project. The Board of Funders is one of the Flagships' governance bodies. It brings together the main funders of the HBP and Graphene with the purpose of programming activities in support of the Flagships. The main role of the Board of Funders is to discuss and plan the Flagships' financial support for their whole duration. More detailed information on governance in the HBP is available here . To find out more about the Flagships' governance bodies, please see the FET Flagships Staff Working Document .